TTAG Test: Do Ported Handgun Barrels Blind Night Shooters? A few weeks ago I asked our readers to give us some ideas of firearms myths and related subjects to test. One of the first people to chime in was our very own fearless leader, who handed down a real noodle scratcher. His question: do ported handgun barrels decrease night vision? The scenario RF had in mind is a typical home defense situation. You’re in bed asleep when something goes bump in the night. You grab your bedside pistol, bad guys rush in, and you fire. What RF wanted to know was whether a top-ported barrel would vent the exhaust from the round into your line of sight and blind you, possibly slowing down follow-up shots. To test RF’s question about the top-ported barrels we needed three different guns, all firing identical ammo out of identical length barrels. The first revolver would be a control (no porting). The second revolver would to be a top-ported revolver. The third pistol would need to be a side-ported revolver— to determine if any decrease in night vision was due solely to the porting or if position was a factor. Luckily RF had three such pistols lying around TTAG HQ. I try to keep politics out of my writing as much as possible (Lord knows RF does enough of that around here for all of us). But I just had to mention this one minor hiccup in our plans. We would have finished this test two weeks ago except Virginia does not allow the purchase of more than one handgun in a 30-day period. The only way around this: a Virginia CCW permit. Luckily, I had filed for my permit over a month before RF sent me the revolvers; otherwise we would still be waiting another 30 days to pick up the last gun. My permit came in two weeks after the handguns. In the meantime I was able to write a review of the top-ported Performance Center Smith & Wesson 67-5 (top right). The other two guns were a Gemini Customs side-ported Smith & Wesson 642 and a bone stock Ruger SP101. The test consisted of two smaller tests. The first test was designed to determine the size and shape of the muzzle flash of each pistol. 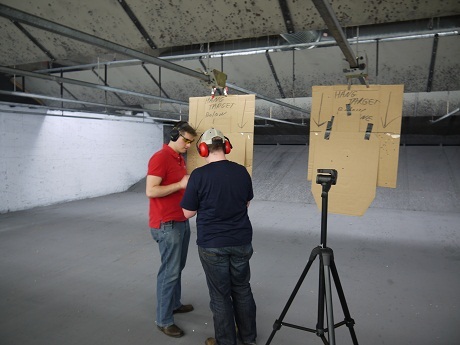 The second test measured the effect of that muzzle flash on human response time. All ammunition was Sellier & Bellot .38 Special lovingly provided by LuckyGunner.com. 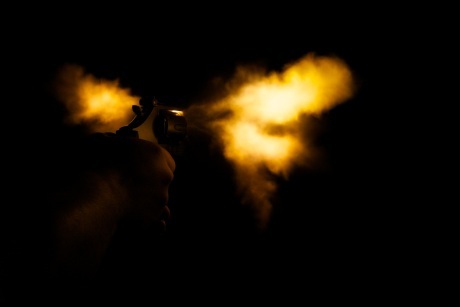 To gauge the size of the muzzle flash from the shooter’s perspective, I placed a camera directly behind the pistol in the shooter’s line of sight. Using the camera’s viewfinder, the shooter positioned and aimed the pistol and pressed the shutter when ready. The camera then initiated a two-second delay, after which the shutter would open for one full second to capture all of the light emitted by the firearm. The camera was set to use auto-focus, ISO 100 and f/3.5. Each revolver was fired five times in the dark and the photographs were later compared. The second test included four test subjects. Three of them TTAG writers; the last was a press-ganged photographer friend. Each subject fired each of the three guns once in the light and once in the dark. Subjects started from a low-ready position facing two IPSC targets approximately five yards away. 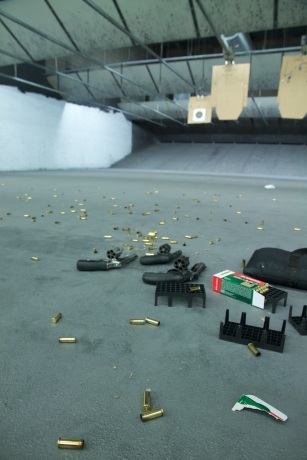 At the sound of an IPSC timer, they engaged the target on the left once, then transitioned to the target on the right and fired three more times. The time (from the buzzer going off to the last round fired) was recorded along with an image of the second target. Each pistol was fired five times, and the picture with the brightest muzzle flash was used for comparison. All images are linked to their larger versions, click on them to see the enlarged versions. The first handgun fired was the non-ported revolver. As evident in the image, the largest flash from the perspective of the shooter is the result of the gasses escaping from the gap between the cylinder and the forcing cone in the barrel. The large flash to the left in this image was an anomaly, of all the five images taken of this pistol this is the only one with such a large flash to one side. A side view of the revolver taken by Michael Dobbs (the press-ganged photographer) more accurately shows the position of the escaping gases. This image was taken of the side-ported barrel. The results of the porting are obvious; there are clearly two distinct jets of flame at 1 o’ clock and 11 o’ clock. 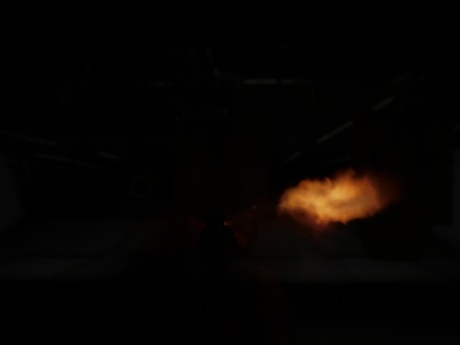 The difference in luminosity of muzzle flash between the non-ported and side-ported barrels does not appear to be very different. But the position of the side-ported barrel’s muzzle flash is definitely closer to the shooter’s line of sight. Again, the side view of the revolver pinpoints the location of the escaping gases. While some gases are seen escaping from the cylinder gap, the majority of the gases seem to prefer the ports along the side. In contradiction to our hypothesis, there was no fireball seen jetting from the top port in the top ported pistol. Instead, the gases escaped through the cylinder gap in a manner similar to the non-ported pistol. However, these side emissions were both larger in size and luminosity as well as being more consistent. The side view confirms that the emissions form the cylinder gap are both brighter than the same emissions from the non-ported gun and in roughly the same location. This may be due to a larger space between the cylinder and forcing cone, allowing more gases to escape via that gap. 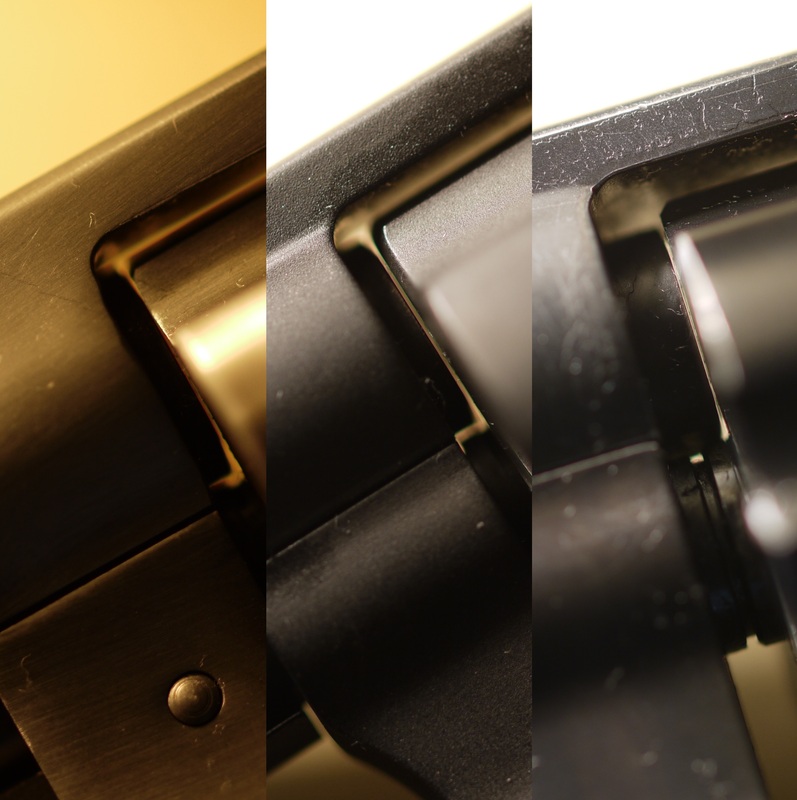 This image is a close-up of the cylinder gap on all three revolvers. 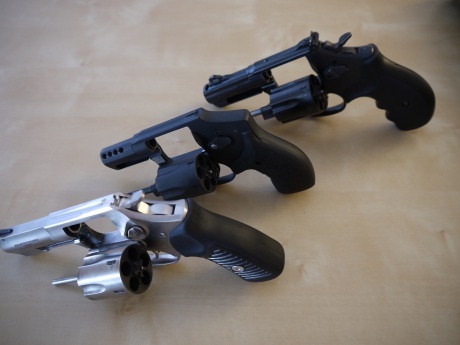 The non-ported Ruger SP101 is on the left; the side-ported Gemini Customs-modified Smith & Wesson 642 is in the middle, and the top-ported Smith & Wesson Performance Center Model 67-5 is on the right. It indeed appears as though there is more of a gap between the cylinder and forcing cone of the top ported revolver as opposed to the non-ported revolver. After all four participants had run the course the individual times were averaged together to form a better idea of how the average person’s night vision would be affected. 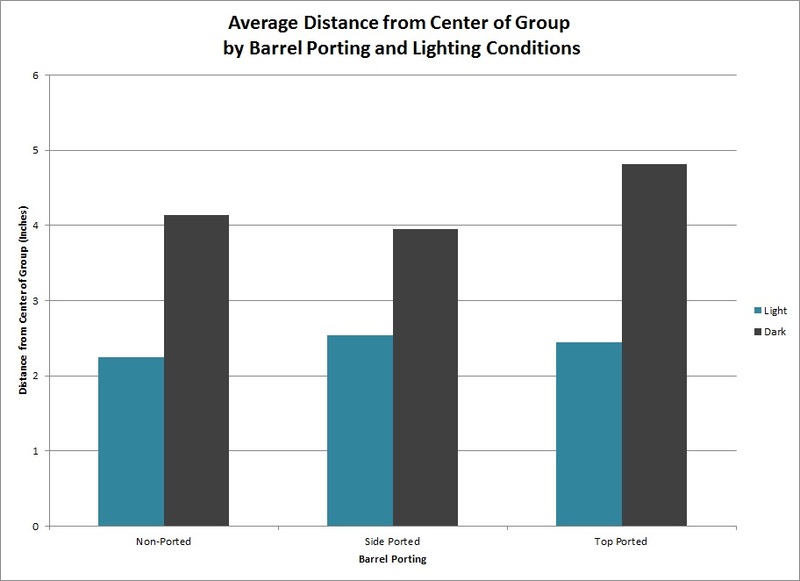 The following chart represents those average times in a bar graph format. 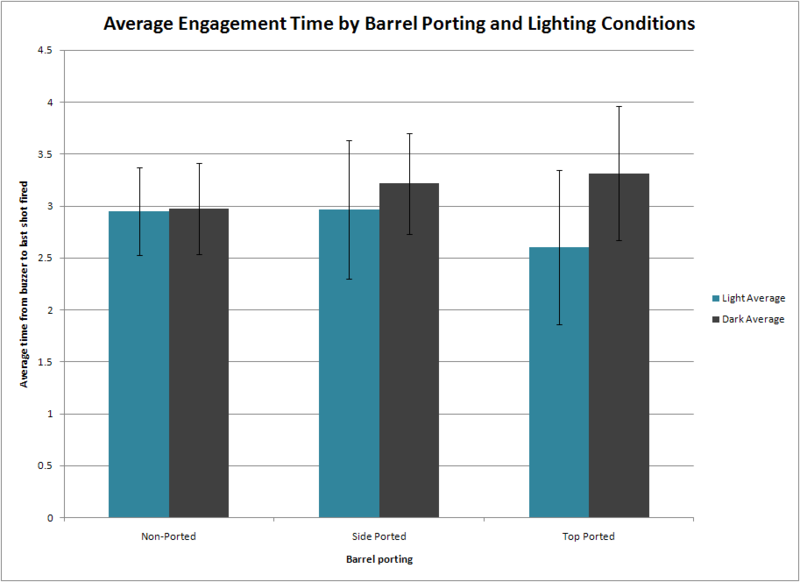 The vertical axis represents time, the horizontal axis breaks out the times between the type of barrel, and the colors represent the lighting conditions. As shown in the graph, there is a definite difference in the engagement time between the types of revolvers. 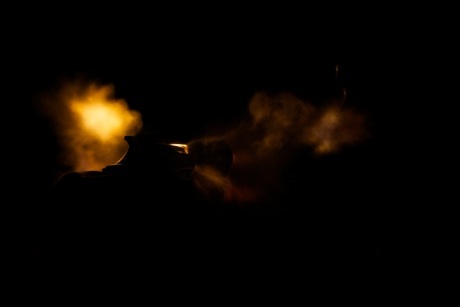 Despite the muzzle flash of the non-ported and side-ported handguns being roughly equivalent, there is a noticeable increase in the time it takes to run the course in the dark over running it in the light with the side-ported gun—more of a difference than with the non-ported firearm. 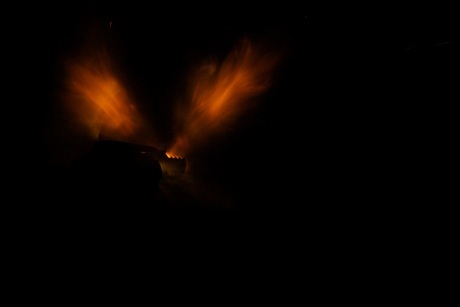 This suggests that the position of the muzzle flash may affect the shooter’s night vision. The discrepancy in times is even larger with the top-ported barrel. However, as the pictures indicated, the top port did not actually produce a fireball in the shooter’s line of sight. Instead, the top-ported revolver produced a muzzle flash similar in size and location to the non-ported revolver—except much brighter. This suggests that a brighter flash—regardless of position—degrades the shooter’s night vision more than any change in position. The effect on target was calculated as the average distance from each impact to the center of the group (two rounds 4 inches away would be an average of 2 inches from the center of the group). All calculations were done using the On Target software. As shown in the graph there was a definite change in the accuracy of the shooters between shooting in the dark as opposed to in the light, and the largest change was seen in the top ported pistol. These results are consistent with the time based results and support the same conclusions. According to the Test 2 results, the top-ported barrel decreased the shooter’s night vision more than either the side-ported barrel or the non-ported barrel. 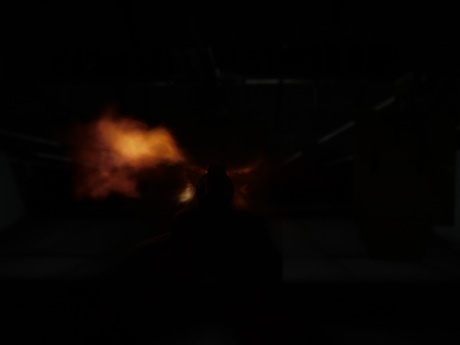 However, as shown in Test 1, this was due to the brightness of the flash coming from the cylinder gap, not a muzzle flash directed into the shooter’s line of sight. From these results it is my conclusion that while the position of the muzzle flash does degrade the night vision of the shooter, the brightness of the flash is a larger factor. Based on this conclusion, when purchasing a pistol for home defense or concealed carry, the buyer should be far more concerned about the size of the gap between the cylinder and the forcing cone than whether or not the barrel is ported and/or where the porting holes are located on the barrel. While a ported barrel does seem to increase the transition time between targets in the dark, having a large flash from the cylinder gap increases that time by a factor of three. Ported or not is up to shooter’s preference, according to their desire for its minimizing effects on felt recoil [not tested here]. Just make sure the cylinder is snug against the forcing cone. Man, you weren’t kidding about there being some results. Awesome stuff, glad I was able to help pull some of those triggers. Your bar graphs need error bars. We don’t know from the way the data is presented whether the results were statistically significant. I was planning on leaving them off to keep the graphs simple, but I did make versions with 5% and 95% confidence error bars. The first one has significant overlap when including the error bars. This was because the 4 shooters included in the sample had drastically different times (the variation was well over 50%). I’m sure if we had a larger sample size those error bars would come way down, but our time on the range was very limited. 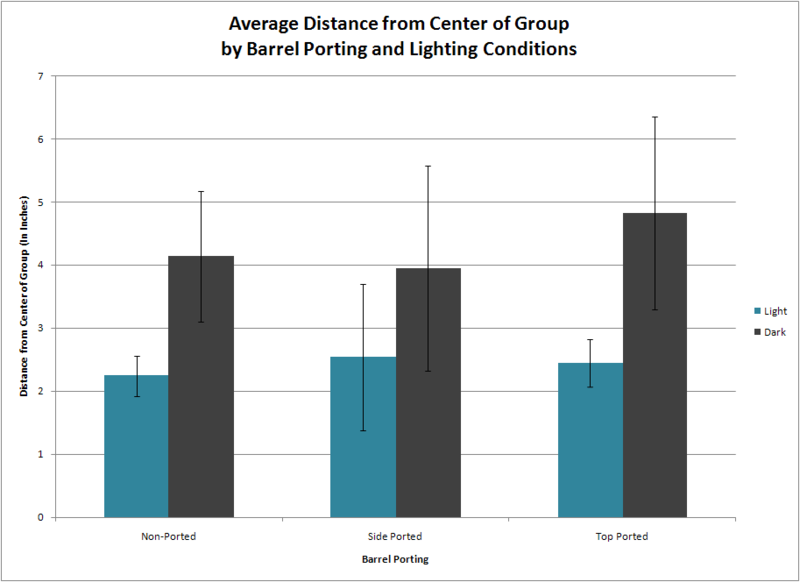 The data for the groups was much more consistent, and the error bars reflect that consistency. With one exception the means are all well outside the range of the error bars. While I agree error bars are nice to see, they are not the true measure of statistical significance. Statistical significance is determined by looking at the P value, which was also left out of this analysis for simplicity’s sake. Given that there are 12 distinct arrays of data to interpret for each metric (time and group size) finding the P-value would have taken a rather long time and still would have a significant level of error (12*.05= .6 or 60% error). In my opinion, interpreting the results without using a P-value was good enough given the caveats inherent in the testing procedure (small sample size, etc). Cool test, well done. I hope to see more of this kind of real-world empiricism. NGC – If you have ideas, please let us know. We’re anxious for this stuff. A few of us have pointed out on several occasions that we’re looking for your feedback on the articles you want to see! Shoot us some ideas / questions and we’ll see what we can’t do about them! With a sample set of only 4 people, it is unlikely that even p-tests, or any test for that matter, will give you any statistical insight. ANOVA might give more insight, but as you said – the small sample size will limit the ability to interpret the results. Nice work regardless! I would have let you guys test my three 500’s and you would have seen (pun intended) what night blindness is all about. These badgirls would make those flames look like girlie matches. I’d like to see this done with semi-autos as well. Having fired a G19C directly next to a G17 (closest comparison I could quickly acquire), the muzzle blast out the front of the G17 always seemed just as bright as that coming out of the G19C. I wonder if/how the results would differ without the extra variable of cylinder gap. Point taken David. We DID have my 1911 and Ryan’s PT145 that night; but they were just there for fun, and not part of the test the first go-around. Who knows; maybe there’s a round two in there somewhere! I’ve tested a Glock 17C and was very surprised how little flash it has at night. Very little difference to a non-ported version and sort of a dull orange vs the bright yellow I expected. Didn’t seem to obscure visibility of night sights or target in any meaningful way. I wonder how long of a separation there was between the lights-on and lights-off shoots. 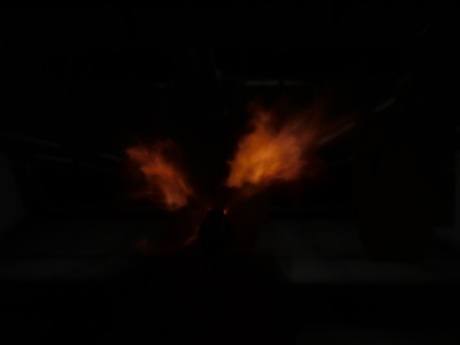 If you shot the lights-on shoot and then immediately shot the lights-off shoot, the pupils of the shooters would still be relatively contracted, minimizing the effect of the muzzle flash. I speculate that things would be MUCH worse if the shooters were given, say, 30 minutes in darkness, to really allow their eyes to acclimate, before shooting the lights-off course. This is consistent with a “woke up in the middle of the night to an intruder” scenario, or, “walking down a dark street and accosted,” or something like that. We waited between 30 seconds and a minute for the shooter’s night vision to adjust. I would have liked to have waited 30 minutes, but at $150/hour the range wasn’t cheap and I couldn’t afford to spend the time doing that this go-around. I would really like to repeat this with ported semi-auto handguns, removing the cylinder gap variable (HINT HINT RF). If I get to do it, I’ll be sure to have the shooters in the dark for much longer before firing. Having served in the military and shooting ported guns at night first hand the test is not fully conclusive. While in the we have fired guns like the M-4 and M249 at night and non off us were blinded and it affected our fighting capabilities. Firing a ported shotgun at night like a Vang comp didn’t blind any of us during a night shoot. Now to handguns, a top ported pistol is going to produce a significantly different result vs a side or V ported gun like a Glock 17C where it is ported on the top of the slide but the gases go off to the side. Firing a Glock factory compensated gun at night has not blinded nor negatively affect us at night. There are even some police departments that issue the Glock 22C. Below is a link to Mas Ayoob considered one of the experts in his field of firearms who keeps a side ported gun at home for self defense. I hope you do a test with more guns and more shooters to get a better sample size. I applaud your effort and don’t see this as a one sided push. Keeping your focus on the front sight and target vs staring and anticipating the flash may also be a factor to consider. This was a good article, but as stated above, I would like to see it with semi-autos and a wider selection of test subjects. Additionally, I believe the effect of the muzzle flash is overstated in low light combat. Obviously, it can have some effect, but that effect is often mitigated by supplemental lighting, like a tactical flashlight. Popping off 60 lumens + from a Surefire light completely negates the effect of muzzle flash. Something most overlook with regard to compensated guns is that they are somewhat dangerous to fire from a close contact position (gun against the side of the body). They tend to vent the gases directly up into the shooter’s face. It’s an effect worth mentioning, as most people focus on the benefits of the compensated guns and not any of the drawbacks. I’m curious, did any of these guns have night sights? That would make it significantly easier for the eyes to adjust under the low light conditions, and might reduce the time differences noted in the test. Also, I’ve read that manufacturers of premium “carry” ammunition tend to add chemicals to their powder blends in an attempt to reduce muzzle flash, so I was kind of surprised you used regular S+B for the testing. It would be interesting to see a comparison of several brands of JHP personal defense loads. The Top Ported pistol had a tritium front sight, and the side ported pistol did have Crimson Trace laser grips. We tried to keep the laser from turning on during the shooting, but in one instance it accidentally did. Notice the significant overlap on the middle bars? Pretty sure that’s due to the laser sight. Another variable I’d love to test out in the future, along with semi-auto pistols. This is an interesting article. You should have measured the gap on each of your six guns. This is very simple to do with a set of feeler gauges. This test really isn’t a fair test: you test carry pistols with standard target ammo. I say this because I carry a ported gun with some regularity, and I’ve shot both target ammo and my chosen carry ammo (Hornady Critical Defense) through it at night outdoors, and there is an EXTREME difference between the two. Target ammo tends to burn a bright yellow-white, while Hornady CD burns a dull red-orange. The former has a noticeable impact when fired from a ported or non ported gun, the latter has no noticeable impact from either. I enjoyed the write up, appreciate your fine work, and have a few other questions to ponder in case you get around to a follow up test focused on a low light scenario. My logic string of a low light shoot follows that you will first want to verify that the burglar in your house with a gun is not really drunk uncle Eddie who has a house key and is holding a beer. So any middle of the night plan for me starts with the question of flashlight or weapon mounted light to illuminate the target? Once you are/have illuminating your target does the porting argument still hold relevance? Does shining a light at someone else do more damage to their night vision than your own? If the scenario doesn’t immediately turn into a gun fight, what have you done to your night vision? Can you turn your light off to conceal your location and still see your sights well enough to cover the target? Do night sights help with this or not? What sight is best? Red Dot? Laser? My tests are far from formal, but I have experimented and put a lot of thought into this. My go to bump in the night gun is a Glock 19 with Carver 3 port compensator, night sights and a Streamlight laser light.